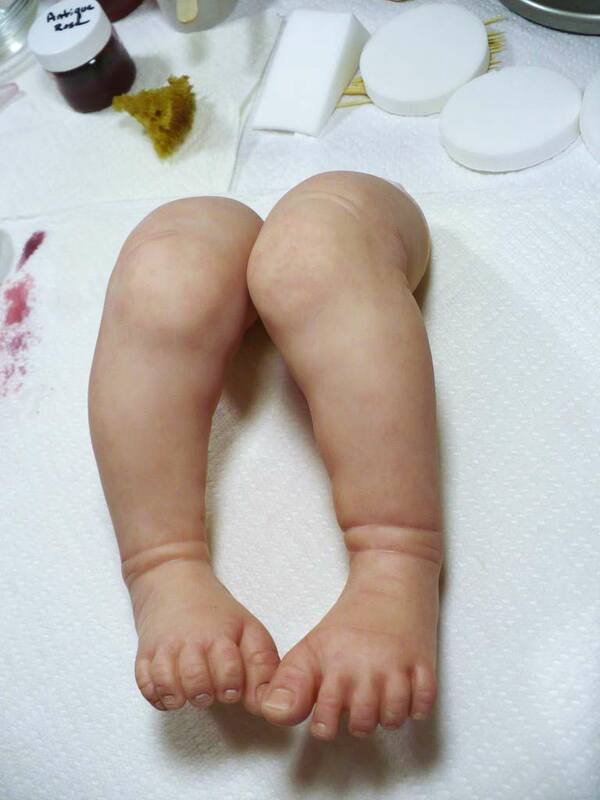 This set of photo’s will show the creasing of the feet and the initial blushing of the feet. 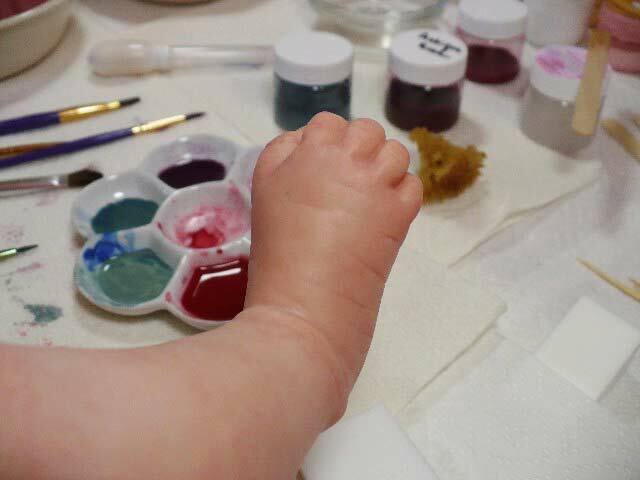 The important point on the bottom of the feet is to make sure the bottom of the foot is not one solid color. 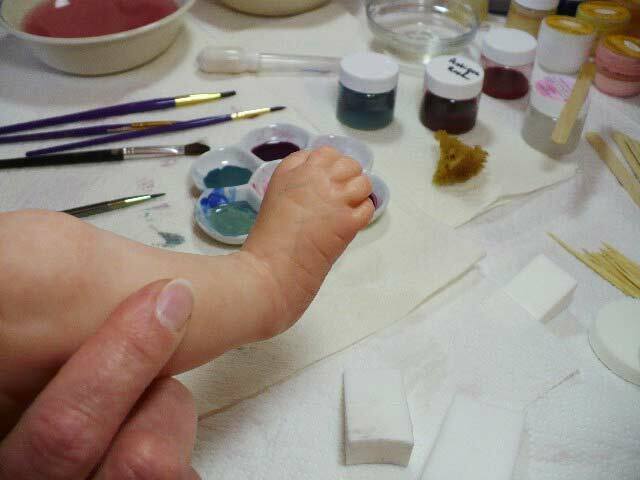 Keep the crease and fold color in the creases and folds and away from the center of the foot. After all of the creases and folds are done on the legs, use that small kitchen sponge cloth to blush the pads of the feet, the heal, and the knee. You may also do other places on the leg to add dimension but remember, this is the first blush so keep it very light. You should be happy with the color of the nail beds by now so you can add half moons and tips at this time. I like to keep these details very subtle. The colors I use are Matte White and Cream Yellow creating a soft ivory color. A small brush is useful in creating the moons, using toothpicks to shape and refine them. The same goes for the nail tips. 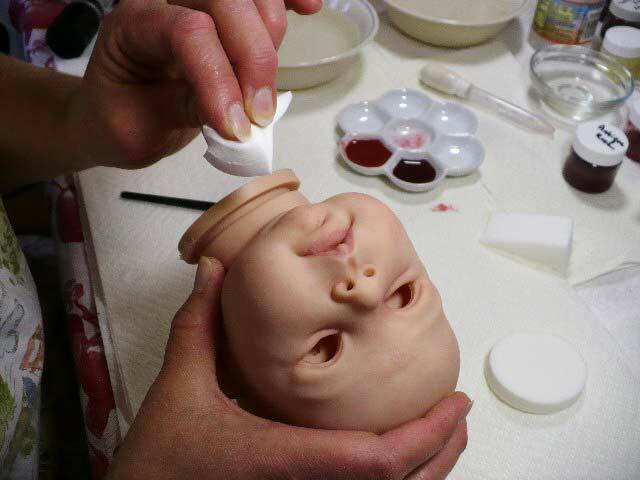 For the second and third layers of blush, it is helpful if you know if your doll will be a boy or a girl. For boys, I tend to use more of a burnt orange color for the second layer of blush. I get that color by blending red and brown with a smidgen of black. For girls, I use a more peachy tone. This baby will be a boy so I will use the burnt orange color. 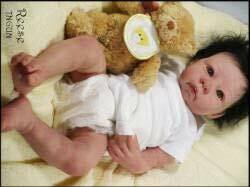 This will be the heaviest blush and in some cases the final blush depending on what you are trying to attain in the overall look of the doll. I like to use a mop brush to do the last two layers of blushing. The mop brush is perfect for that mottled look. Dip it in the paint and then onto a dry make-up sponge or paper towel to remove the excess. 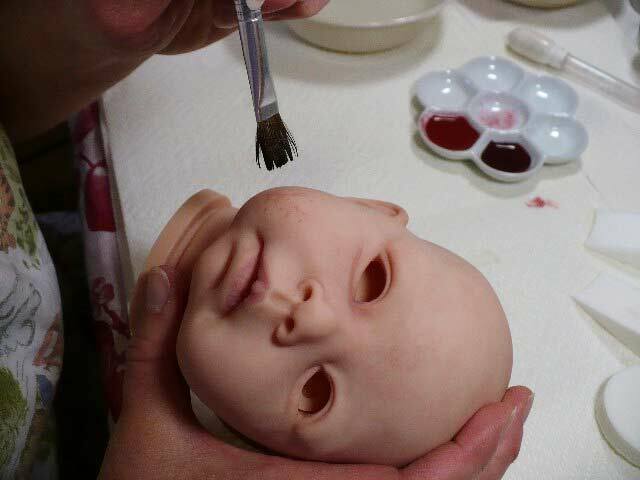 Then dab the paint on all of the high, fatty spots of the doll: The cheeks, the chin, the ears, above the eyes (but not over all the eye…just select places, again, we are building dimension, not a solid color), over the bridge of the nose and on top of the head. On the limbs, again, all the fatty places, the knees and elbows and the pads of the feet and hands. You may also individually blush each finger tip using a paint brush. 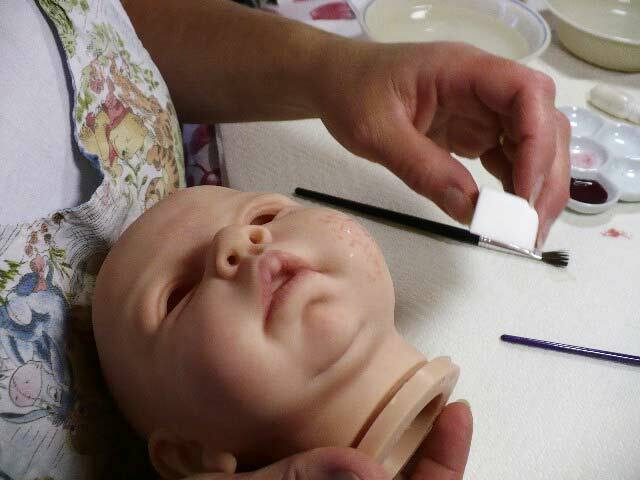 If your doll is a thumb sucker, be sure to paint that thumb redder as if he or she had just sucked on the thumb. Of course go over each mottled area immediately with a dry make up sponge/wedge. The amount of pressure you apply to the sponge or wedge determines the amount of mottling you will have in the end. Re-apply if necessary. When you are satisfied with the second layer of blush, choose another color (I like more of a pink color for this layer for both boys and girls) and do a lighter layer of mottled blushing in all the area’s you just blushed. Do not completely cover the entire area…just give it some dimension. 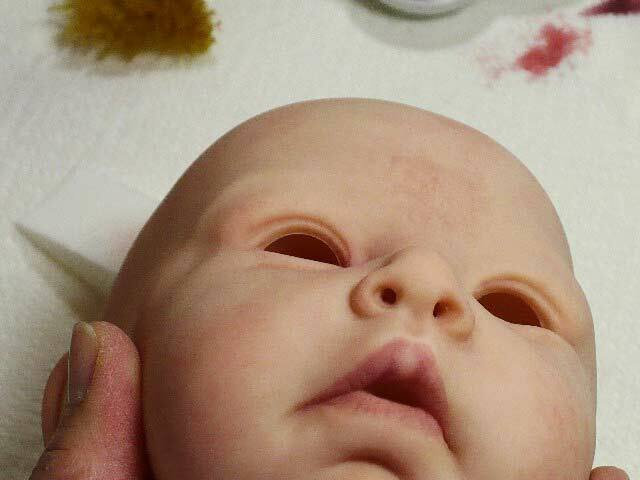 I did not do this layer in the tutorial pics but I did do this layer later when I took a second look at the doll, which you will see in full finished form at the end of this painting tutorial. Now for some extra details like capillaries, veins and final lip details. For the capillaries, use a darker red. A natural sea sponge is the best thing I have found for capillaries, short of painting each one on with a tiny paint brush. Clip a very small section of the sponge off, choosing which tentacles you think will work the best for the area you will be using it on. Capillaries can be found on the eye lids, at the side of the face, around the nose and in various places on the limbs. 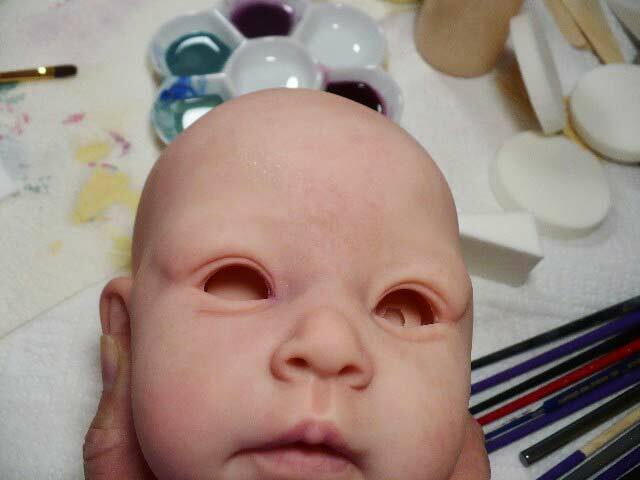 Be creative and look at real babies to see all the unique places they are found. Dip the natural sea sponge into the red paint and dab it off on a dry sponge or paper towel. 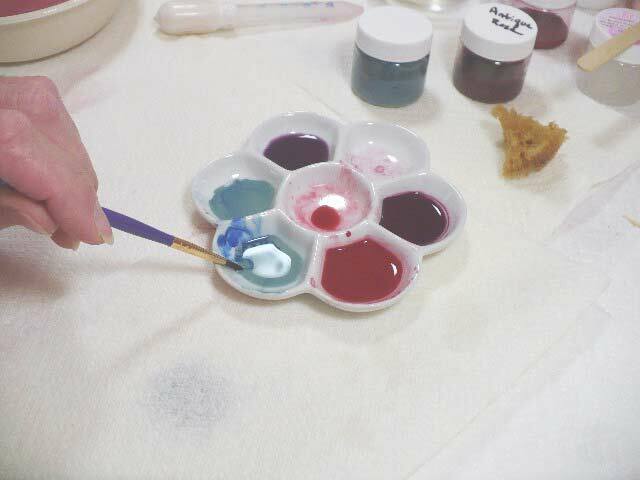 Lightly touch the area that you want the capillaries to be and gently dab excess paint off with a sponge or brush. 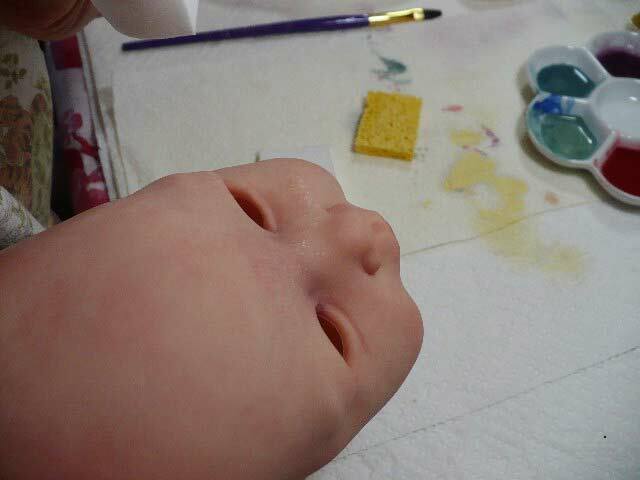 At this time I will blend some purple/mauve color to use across the bridge of the nose and in those area’s that are a bit purple on babies. For me, the veining is the third to the last step in the painting process. 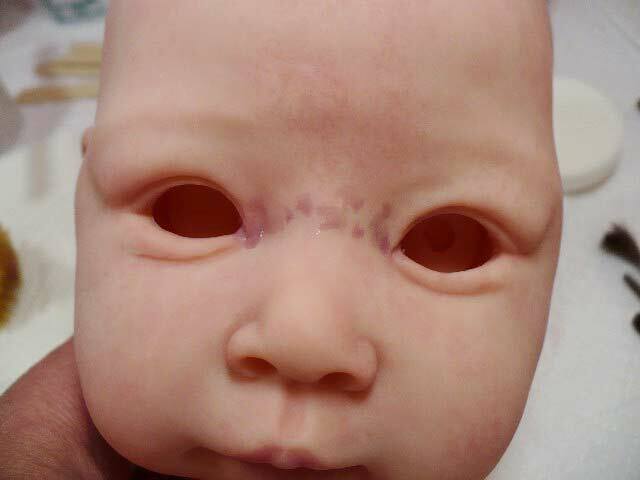 However, I do them in a way that makes them appear just under the “skin” of the doll. It is important to do your vein work after the other layers of paints have dried for 24 hours. 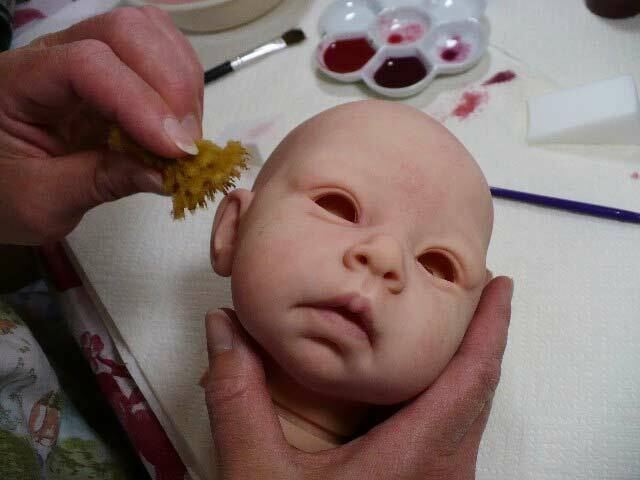 The technique I use for the veins requires the use of a fairly wet sponge which can remove fresh layers of paints so let the doll cure 24 hours before applying veins. ***I have mixed up a mixture of a blue/green color, more to the cornflower blue, I have also put a little bit of dark blue on the side of my pallet to use a I see a need for more color. I want to give a 3D depth to the blue vein. I use a round brush for the veins. This makes a rather wide vein but with my technique, the vein will look real when finished and not drawn on. 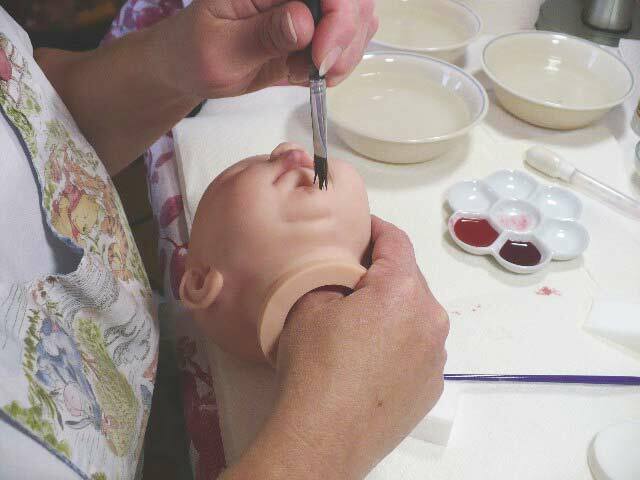 The important tool in this technique is a WET make up wedge because the vein is drawn on and then quickly pounced with that wet sponge. 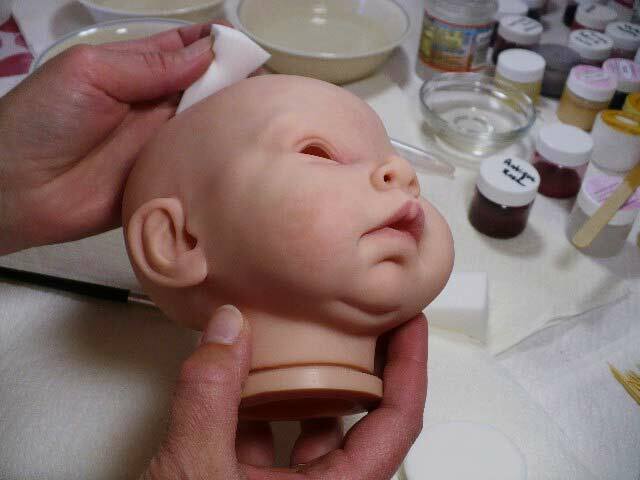 Apply the paint very thin and get it blended in a hurry with the wet sponge then use a dry brush to finish it up. It is not going to be a solid line. It will be a broken line, because that is really what veins look like. Do some various veins at the bridge of the nose, up the forehead, by the temples, in the ears, on the tops of the hands and feet as well as in the palms of the hands and the bottom of the feet and on all sides of the arms and legs. 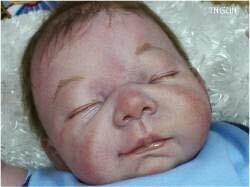 There as many placements for veins as there are babies on the earth so just look at the doll as it is now painted and decide where you think the veins should be. The second to the last detail is what I call the highlighting/shading detail and I am going to use an ivory colored paint. I am going back to that same color that I mixed up for the tips of the nails, but I am going to add a little bit of white to it, just a tiny bit and then I shade over the bridge of the nose, just a wee bit down the cheek, down the ridge of the cheekbone from the ear to the chin, across the forehead a little bit, across the tops of the hands and the feet and also on the bottom of the foot primarily in the center of the foot and up the leg from the outer toe on into the inside of the leg at the top. 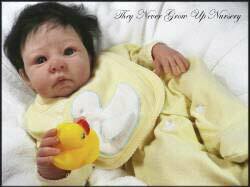 If you know what color of hair you will be putting on your reborn, you may now sketch the tiny eyebrows on. 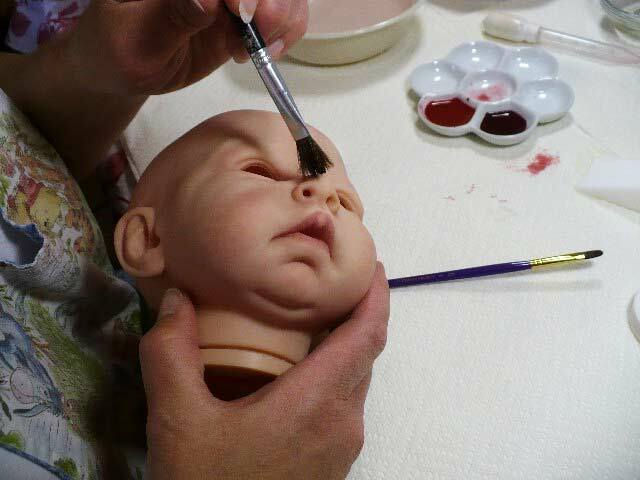 I know that this baby will have dark hair so I have applied dark brows to him using a tiny, tiny brush. Once I have brushed the brows on, I go over them with a toothpick creating more “hairs”. Then I soften the entire look with a sponge. Keep building the brows until you are satisfied. If you are unsure of the color of the hair you will use, then draw the brows on after you have rooted the head. 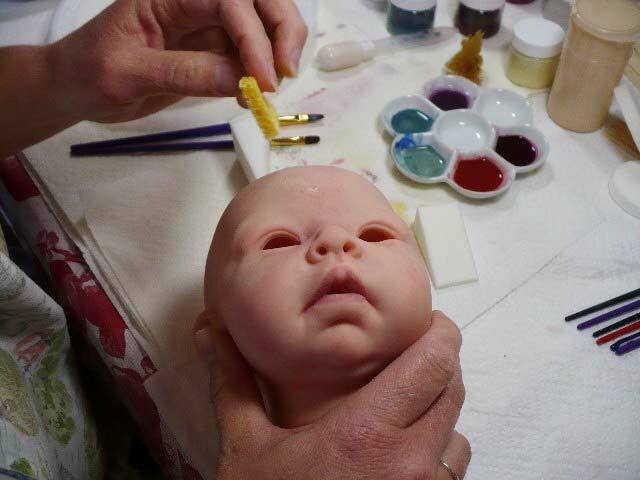 As promised here are a couple photo's of the "Intensely Painted" doll that I named Petey. When you are ready to root your hair or assemble you reborn, be sure that you have allowed time for the paints to cure. In the summer, this takes 24-48 hours. In the winter, it can take a full week. Cure your paints in room that is 70 degrees F or warmer. This brings this painting tutorial to an end. Oh... you say you want to see the finished tutorial baby? Alright...here he is! I named him Reese and he has gone to a very loving home in Louisiana where he is being spoiled with all kinds of wonderful things. Feel free to email me with any questions…and happy reborning!